Through the years your needs have been addressed and your problems have been solved by Boschert, "The Standard of the Industry Since 1948". That's why today Boschert has the most extensive range of Safety Chuck sizes types, and accessories - including the revolutionary Axial Sliding Safety Chuck. Boschert makes Axial Sliding Safety Chucks in four popular sizes capable of handling rolls has heavy as 6200 pounds and torque as high as 800 foot pounds. Sliding chucks are essential when precise location prior to starting the operation is necessary. Previously when your roll was not correctly located on your roll shaft, it was necessary to "nudge" the roll to the right or to the left. Sometimes this action results in damage to the roll edge affecting not only quality, but also production speed. These problems have been solved by Boschert with the introduction of our Axial Sliding Safety Chuck. Boschert makes it easy to locate the roll for correct entry of the roll web into your machine: simply turn the crank handle located at the back of the driver unit. When the roll is precisely located begin your operation. It's just that simple. Because of the ratio of revolutions from the crank handle to axial movement, the driver stays put. 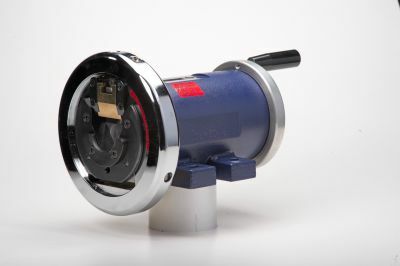 Since the follower unit is a slave unit connected to the driver unit by means of the roll shaft, Boschert provides a means to lock the follower unit so it does not move out of position at the end of the run, during loading and unloading.